Monitor success of your business goals with KPIs (Key Performance Indicators) & Scorecards that are based on your SQL, OLAP, ODBC and CSV data with Kyubit BI Software. Set alert emails that are triggered by particular KPI status. 'Kyubit Business Intelligence' dashboards are Scorecards and KPI software that connects to your OLAP, SQL, ODBC, CSV data to create KPI status, indicators, metrics and charts that quickly indicates current status of important values within your data environment. 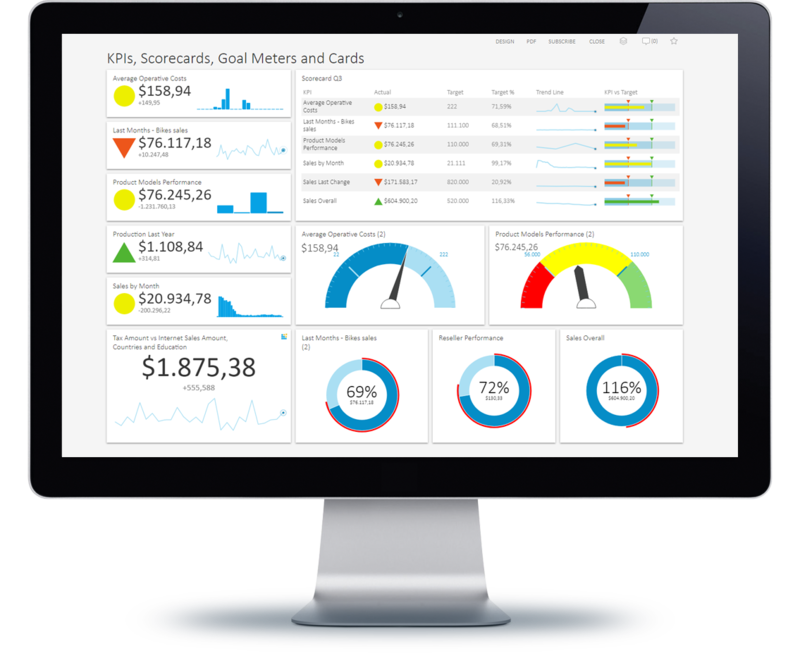 Kyubit Scorecard and KPI software includes KPI visualizations that are easy to design and implement on dashboards together with other important visual metrics. KPI status is represented with current value, KPI icon or Gauge and small line chart that presents recent changes of values in time. Organize multiple KPIs to Scorecards that displays KPI Goal, Target, Target percentage and trend lines. Dashboard could contain any number of KPI tiles. Click magnify icon to display KPI in enlarged view. KPI consists of current value, last change and KPI status sign (Success, Even, Fail). KPI has option to display line chart that presents recent KPI value changes, based on KPI definition (see next section). 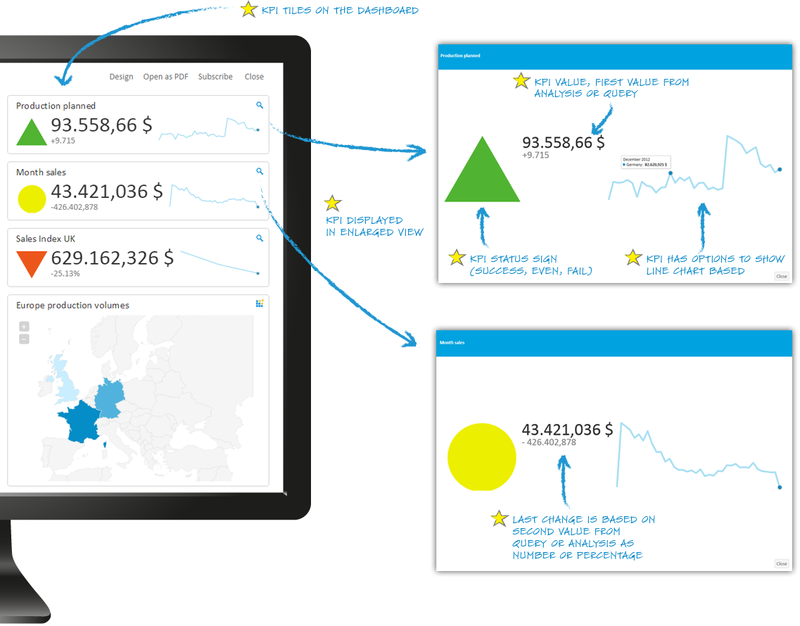 Defined KPI could be reused on many Dashboards. KPI success thresholds could be defined as fixed values of values from query or analysis. When value is defined using query or analysis, 'KPI Value' is always fist value from data set. When value is defined using query or analysis, 'KPI Last Change' is defined by relation between first and second value from data set. Visualize previous KPI values by setting line chart that illustrates how KPI value has changed recently. Organize multiple KPIs on a single Scorecard list that presents each KPI success, values, target, target percentage, recent values as small line chart and visual progress of the current value from fail to success status (value bar). 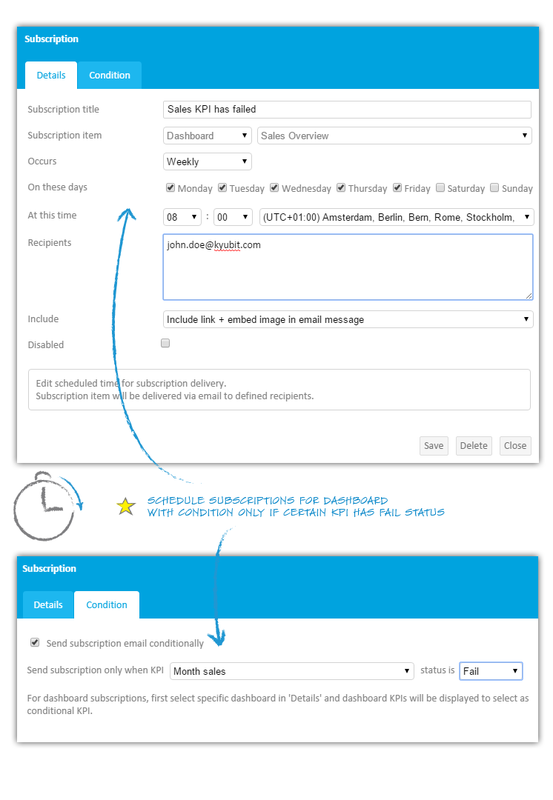 Set condition to send scheduled subscription only if certain KPI has 'fail' status. 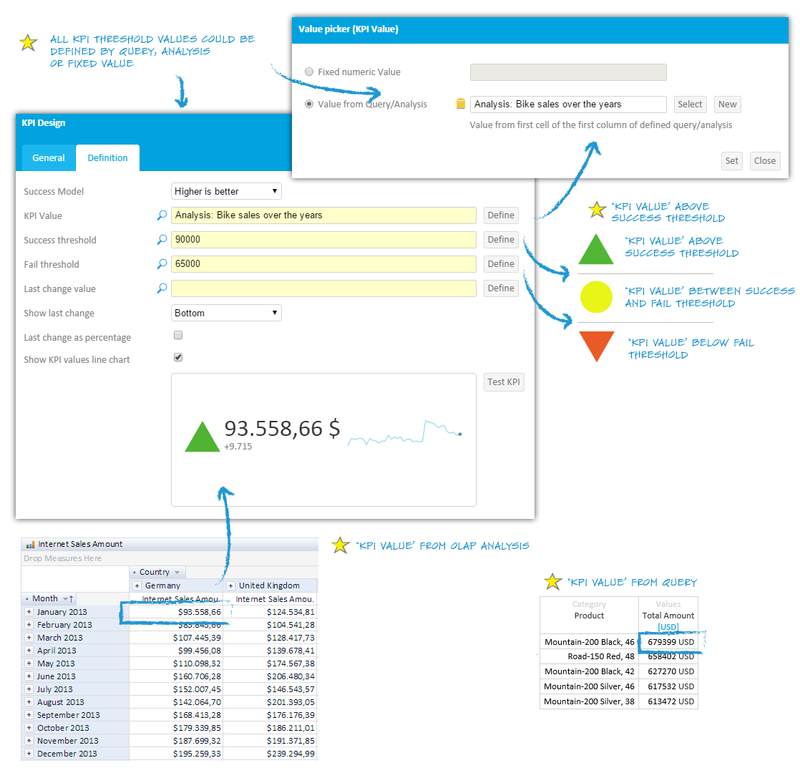 Download 30 days evaluation of 'Kyubit Business Intelligence' and see Kyubit KPI software features in action. Download 'Kyubit Business Intelligence - User Manual' which covers all aspects of 'Kyubit Business Intelligence' KPI software.